Last week we sat down to have dinner when I realized Aiden had the hiccups. So after we prayed I put Damon's hand on my stomach so he could feel it. He started to giggle. I told him that Aiden had the hiccups and that is what it feels like in my tummy. So then we got to talking about how Damon had them occasionally but Xavier had them alllll the time when they were babies in my stomach. Which I always find funny because Xavier always gets the hiccups, especially when he was a baby. So then Xavier had to come over and feel my stomach so he could feel Aiden with hiccups...which he claims made him hop. After dinner, Damon ended up getting the hiccups and then right before bed, Xavier got the hiccups too. So they got a kick out of the fact that all the boys got hiccups that evening. Today the teacher met me to pick up Damon with a paper in her hand. She said, "We had a VERY good day at school today." She had a list of about 10 sentences that Damon not only put together but also spelled every word out. She was so proud of him she had to show me his work. Mrs. Fisher said it was funny because she was trying to get him to spell out words and he wouldn't do it, the reason was he wanted to do entire sentences instead of words. She then took him to the office, his reading teacher, his speech teacher, and one of the other Kindergarten teachers to show his progress. They also took a picture of him with one of his sentences he formed. She also said what was cool about it is that some of the other kids wanted to do it too after Damon had done it. He's such a leader! Damon had his first school program tonight. It was the cutest thing. The greatest thing about the program was watching the kids bow their heads after every song. It was so cute and everyone of them, all 65 Kindergarteners did it. The least greatest, watching one of the kids throw up, but very pleased it was not mine nor was he standing near mine! Today it was really nice outside so Xavier and I walk to pick up Damon from school. As we were walking back home, Damon showed me a dime a friend gave him. The friend is a girl named Kamiah who happens to be African American. So being the mother that I am I start to tease Damon about Kamiah liking him. He says, "She can't like me and I can't like her." At this point I am shocked, appauled, disappointed, embarassed and wondering why in the world would he say something like that. 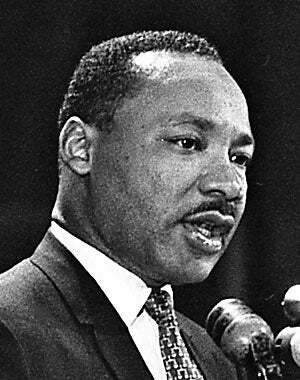 Just a few weeks ago was Martin Luther King's birthday which we talked about at home and at school. And given the fact we do not come from the most diverse city we are also not complete rednecks. So I say back to him, "You know we like people for who they are, not what they look like." He says, "Yes, but white people don't like black people." "School, that is what Martin Luther King said. White people shouldn' like black people." So luckly we had a couple more blocks to go and HOPEFULLY we clarified that was NOT what Martin Luther King said...thanks Bergman for the top quality education!